There was a time when you could get a Ford or a telephone in any color you wanted--as long as it was Black. Similarly, there was a time when concrete repair materials were available in either Grey or Gray. 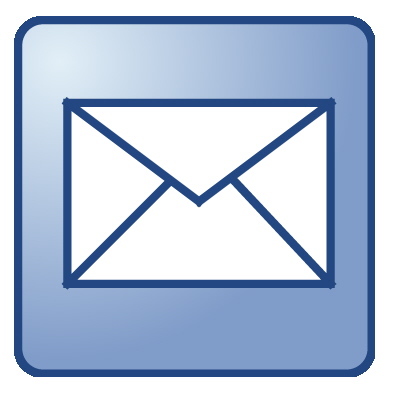 At some point, for some applications, function alone becomes insufficient. Perhaps it is simply human nature that as we grow accustomed to reliable, maturing technologies, we eventually turn our attentions toward attaining higher levels of aesthetics in the functional things which have become part of everyday life. Over the past 15 years, prepackaged repair mortars which provide both functional performance and positive aesthetics have become increasingly available and popular in North America and Europe. By closely matching the repair material to the color and texture of the host substrate, we can achieve repairs which do not noticeably alter the visual character of a building. And having opened the door to an era when aesthetics may be becoming a basic component in a product's list of expected features, we find that increasingly better fulfillment of aesthetic objectives becomes imperative. In no specialty niche in the repair industry is it more evident that the aesthetic "bar" is constantly being raised than in the Historic Restoration/Preservation industry. Frequently Historic Restoration involves buildings and monuments originally built to an exceptional level of aesthetic quality, and preserving those aesthetics is considered basic to maintaining the value of these structures. The challenge of achieving repairs of aesthetic quality comparable to the original construction is even further heightened by the widespread acceptance of Portland cement-based repair material technologies for repair of non-cementitious substrates, including both natural building stone and manufactured masonry, such as terra cotta. 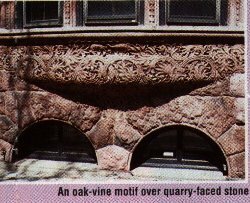 Decorative masonry elements often display a level of artistry that is without parallel in concrete construction. The flow and detail in the shapes and colors just aren't found in balcony and bridge deck repair. And in masonry repair applications, basic differences between the physical properties of cement-based mortars and masonry substrates compel consideration of compatibility requirements which may be taken more or less for granted when repairing concrete substrates. Terra cotta, for example, is a fired clay composite, consisting of a relatively soft, porous body or bisque, with a relatively hard and impermeable vitreous fireskin or glaze. It has a linear coefficient of thermal expansion only about half that of concrete and it may typically absorb up to two or three times as much water. Affix a Portland cement-based repair material to this composite substrate and there emerge some interesting performance differences to resolve if successful and durable aesthetic repair is to be realized. How is success in aesthetic repair appraised? That's not easy to specify, as there is a highly subjective element in all of this. Furthermore, a job that "looks good" when it is completed, or even a few years later, has only cleared the first hurdle to becoming a true success. In the world of aesthetic repair, and particularly in Historic Restoration, perspectives deal in decades and centuries, not years. We may look back on a number of projects completed 10 or more years ago and conclude that they have achieved "interim success" status. But the bar has long since been raised by clients who instantly expected increasingly greater aesthetic results that retain their aesthetic excellence for ever-increasing periods of time. So how do we achieve success in aesthetic repair? Almost paradoxically, the best aesthetic results are generally the unremarkable ones, the ones we hardly notice, the ones that don't look like a repair at all. Why is one restoration such a disaster while another is such a success? It isn't just a matter of workmanship, or even just a matter of color. It is to a great extent, a matter of material properties and selection. The task of determining which combination of material properties is best suited to achieving the goals of aesthetic repair is formidable. Many conflicting properties compete for our attention, and the perfect material which combines everything we would like to include simply cannot exist. Indeed, some properties are mutually exclusive. Emphasize one and we may compromise another. There is little objective help to be had in wading through all of this either. There are no consensus standards guiding the aesthetic repair material selection process at present, and none is immediately forthcoming. Part of the problem is that each party to an aesthetic repair project has his own set of priorities and objectives. The Owner's concerns are cost, appearance and durability. The Contractor is likely to focus on constructability issues--how the repairs will be achieved efficiently, effectively and profitably. Engineers tend to concentrate on mechanical performance properties. Preservationists represent an entirely different set of concerns, based on their knowledge of disastrous past interventions which did irreversible harm to the irreplaceable structures they were trying to protect. Consequently, reversibility and "breathability" (moisture vapor permeability) of repairs are preservation priorities. So how do these differing points of view get resolved into a mutually agreeable course of action? How do we build a consensus? One of the strategies suggested for resolving conflict is to begin by building on those things on which there can be broad agreement. Perhaps the best way to find that common ground with regard to Aesthetic Repair is to set aside the issue of Aesthetics, for a moment, to focus first on the issue of Repair. Fortunately, somebody has already been doing the consensus building on the Repair end of the equation. If we limit our technological domain to cement-based repair materials, ICRI Guideline #03733 gives us a place to begin our material selection process. The first step is to determine performance requirements, and the first question to ask is whether the repair is to be structural, or load-bearing. For most aesthetic repair situations we can proceed from the assumption that we are dealing with nonstructural repairs, as it is rare that masonry elements will be effectively unloaded prior to repair and then structurally reloaded. Note that while traffic bearing surfaces, such as stairway treads, may have requirements above and beyond those expected for vertical surface repairs (e.g., abrasion resistance), these, too, are still generally nonstructural repairs. Having made that assumption, we can straightforwardly produce a priority list of basic and special properties for a nonstructural facade repair. Tensile Bond Strength is given the highest priority, because if you don't have good adhesion, none of the other properties matter. Low Drying Shrinkage is also basic, because higher shrinkage and the shrinkage cracking which tends to occur as a result, allow moisture to gain direct access to the adhesive interface, which engenders disaster for bond strength over the long haul. Low drying shrinkage is one of several important factors which can reduce the likelihood of crack development. Other volume changes occur as materials and substrates exposed to natural weathering go through wet/dry cycling or temperature cycling. If differences between the responses of the repair material and substrate to these changes are too great, sufficient stress may develop between patch and host to induce cracking or distress in the weaker material. This is particularly disturbing when the substrate is softer than the repair material, because the priority in historic preservation is to protect the original, valuable historic fabric, even at the expense of repair material failure, if necessary. Now that we've addressed the basics of Repair, let's go back to the Aesthetic side of the equation. There are some special constructability issues which directly relate to the requirement that colors, textures and complex shapes must be produced. Some repairs may best be accomplished using mold-making and casting techniques; others will require that fine hand work or sculpting be performed. Materials have to facilitate the realization of a wide range of finishes using a variety of techniques. As previously stated, we also have more complex substrate compatibility issues to deal with. Masonry substrates vary widely in composition, and they exhibit differences in coefficient of thermal expansion, wet/dry volume change and even wet/dry appearance change. Finally, there is the challenge of achieving close color matches and of retaining those colors for an extended period of time. This brownstone row house (photo, below) in Albany, New York, exemplifies some of these special considerations. 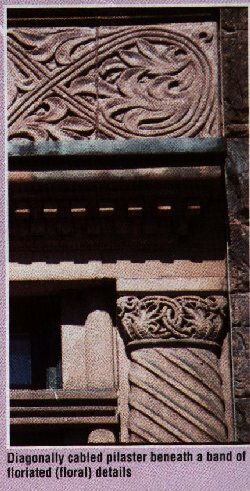 Approximately 75% of the scroll work has been recreated using hand-carved custom brownstone patching compound, working from a set of original photographs. The material used had to closely match the original, and had to permit these intricate shapes and designs to be carved using massive amounts of patching compound without sagging, shrinking, cracking or distressing the soft brownstone substrate.Restoration of the original, eroded and exfoliated stone details had to look authentic and had to satisfy the requirements of the Capitol Historic District authorities. For the owner's benefit, it also cost a great deal less than new stone or precast replacements, which were originally proposed by the historic restoration experts who convened a workshop to study this unique building. Having reached the limits of present-day consensus, let's turn to some of the more contentious issues in aesthetic repair material selection. Long standing differences of opinion remain regarding whether prepackaged or field mixed repair mortars should be selected. The points favoring field mixing is that the specifier and contractor can exercise greater control over mix design, costs are minimized, and the factory lead times sometimes associated with custom matching of substrates are eliminated. Experienced, knowledgeable and meticulous restoration specialists are capable of producing durable, compatible and aesthetically satisfactory repairs. Points favoring prepackaged systems include the reality that most field installers today lack the discipline, time, patience and/or experience required to produce consistent colored repair mixes that are appropriate to the subject substrate. Pigment variations of 1 gram per 100 pounds (45 kg) of repair mortar may significantly effect some color formulations. Colors may tend to change upon aging, and judging mortar colors while wet or insufficiently cured can lead to erroneous selection. Manufacturers of prepackaged systems are expected to produce consistent materials to published performance specifications. They will have taken the time to develop different compatible base mixes for each particular type of masonry. Accelerated curing and weathering techniques can be employed, to assure that patches match after some period of exposure. Sources of good, consistent cement, aggregates, additives, pigments and intermediates will have been located and secured. Precise weighing of all ingredients can be performed consistently, with accuracies up to 0.1 gram where required. Dry, closely graded aggregates are used, eliminating variations due to moisture content or segregation of particles. Careful quality control can assure consistent batch-to-batch appearance, even on prolonged projects requiring many production batches. Furthermore, manufacturers of custom repair mortars have developed extensive archives of existing formulas which can be quickly reproduced, often faster than on-site trial and error matching work can be performed by a contractor. While the use of prepackaged systems was once largely specification- driven, many contractors now choose them for projects in which they have discretion, and there has been continuing, rapid growth in this market niche. One of the more interesting ongoing debates regards the use (or non-use) of latex modified cement technology in customized masonry repair mortars. The "Latex vs. Non-Latex" debate partially centers around the perception in some preservation circles that anything synthetic is inherently less aesthetically or historically correct than something supposedly "all natural" (i.e., sans polymers). Why incorporate latex? Higher bond strength is one of the key advantages cited by latex proponents. There are several different ways to interpret the data in Figure 1. One is that latex modification makes possible a level of bond strength that unmodified cement mortar simply cannot achieve.Another is that with latex the same level of bond strength is achieved with less intensive surface preparation. Or finally, that as bond strength degrades over time, the latex-modified patch will maintain adequate bond strength longer. One of the key advantages offered by acrylic latex modifiers in masonry repair applications is a reduction in modulus of elasticity. This enables the latex-modified patch to deform slightly, absorbing stresses induced by slight differentials between patch and substrate wet expansion and thermal expansion. This significantly improves mechanical compatibility with the substrate. As Figure 2 indicates, it is possible to formulate very low modulus materials when aided by latex modification technology. Opponents of latex modification assert that latexes and the defoamers they generally incorporate reduce moisture vapor permeability. Maintaining "breathability" is one of the key icons of historic preservation. ICRI guideline 03733 indicates that latex reduces concrete permeability by about 50%. Some studies have suggested that latex-modified concrete doesn't "breathe" at all. Others show inconsequential differences between latex and non-latex patch vapor permeability. While test methods for determining moisture vapor permeability of building materials are well established, nostandards for minimum and maximum permeabilities have been adopted in the United States. Even ICRI 03733, which is very direct about setting standards for other properties, and which acknowledges the importance of moisture vapor permeability in certain applications, stops short of recommending an appropriate standard that will satisfy the minimum requirements. This might lead one to ask whether this issue would have been left unaddressed if marginally low moisture vapor permeability was a critically significant contributor to large numbers of repair material failures. How often do repairs fail because of inadequate permeability, as opposed to, say, inadequate surface preparation? The reality is that many materials with much lower permeability than latex-modified repair mortars are used on concrete and masonry on a routine basis. On well-engineered projects, where sources of bulk moisture infiltration are identified and addressed appropriately, these materials perform very well. On poorly engineered projects, higher moisture vapor permeability will not allow repairs to surmount the underlying problems. Summarizing this issue, the arguments for latex modification are compelling in the vast majority of cases, with few exceptions. These advantages are real and quantifiable, and there are decades of successful history of use of this technology to balance the fears of those who oppose it. The industry needs to work toward an evenhanded consensus on this issue if the quality and durability of repairs are to be maximized. Epoxies and other resins have had some successful history of use on granite and marble, which can be relatively impermeable materials as well. The keys to achieving some degree of compatibility using these materials is to load them heavily with mineral fillers which bring the composite closer to stone properties, and to use flexibilized or low modulus resins capable of relieving some of the inevitable stresses which develop between substrate and patch. Long-term retention of flexibility and retention of flexibility at low temperatures are essential, particularly in cold weather environments. Many "flexible" resin systems lose flexibility after a few weeks or months, or embrittle at temperatures that will be routinely encountered in exterior exposures. Finally, we will take a brief look at the contributing role of specialty coatings in aesthetic restoration, because there are times when repair mortar alone just isn't enough. 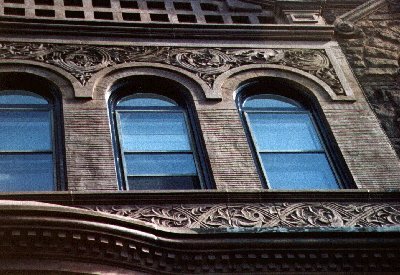 Coatings which are closely matched to the appearance of the existing or original substrates provide another means of preserving the visual character of a building while resolving some specific problems. While aesthetic repair mortars are useful for repairing unsound sections of substrate, sometimes there are otherwise sound substrates to which the damage is almost entirely aesthetic. While aesthetic damages such as stains and dirt deposition can often be removed by various cleaning methods, there are some damages which are permanent and will best be overcome by application of a pigmented coating, stain or vapor permeable sealer. Past interventions or attempts at restoration can sometimes create an entirely different set of problems. In some cases, paints or other surface treatments may have been applied in an attempt to either stabilize or "hide" deterioration. If paints have been applied to rough, porous, weathered surfaces, paint particles may have been deposited deeply within the large pore structure. It can then become nearly impossible to completely remove the coating without severely damaging the underlying surface. In such cases, partial removal and recoating can restore positive aesthetics. Small working cracks may develop in some substrates for a number of reasons. In some such cases, the achievement of durable aesthetic repairs can take advantage of the special propertiesoffered by breathable elastomeric coatings. These coatings have the capacity to bridge small cracks exhibiting limited movement, affording positive aesthetics which endure cyclical movement while also providing a certain degree of moisture protection. 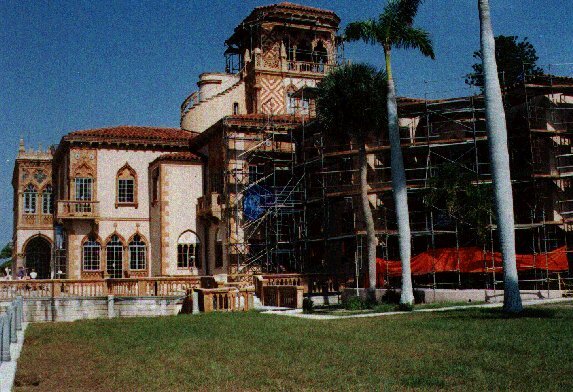 While customized repair mortars allow aesthetic terra cotta repairs to be achieved when the existing terra cotta has a simple, monochrome matte finish, the colors, patterns and finishes found in terra cotta are often far more elaborate. Terra cotta glazes were often intended to imitate granite, marble or other stones, incorporating multi-color patterns, which are not readily duplicated with colored mortars. In some cases, exotic colors were used to produce large artistic murals or designs, and some colors simply cannot be matched in a cementitious medium. In many cases the position of each terra cotta piece in the kiln during manufacture lead to differences in firing and variations in color which are not readily duplicated with mortars. Finally, a great deal of terra cotta glaze has depth, clarity and gloss which are not properly duplicated with mortar alone. In such cases, specialty coatings are required to replace or augment customized mortars. Successful aesthetic repair requires a complete and diverse toolbox of assorted materials. Custom-matched compatible repair mortars, adhesives, crack repair systems, and coatings all have their function and place. But as demand for Aesthetic Repair continues to grow and evolve, from a specialty niche market to the technological mainstream, so does the need for open dialogue and rational consensus building. An Aesthetic Repair task group or subgroup is needed to sort through the issues which are specific to Aesthetic Repair, supplementing the excellent achievements of the task group on Repair Material Selection. These may include development of recommended performance guidelines for properties such as moisture vapor permeability, or appearance standards for color and color change. A clear and objective review of various alternative aesthetic repair technologies, their advantages and limitations could be undertaken, in order to offer the industry the broadest possible set of appropriate alternatives. Conflicting priorities involving the differing disciplines often involved in aesthetic or Historic repair could be addressed, in an effort to resolve differences and build consensus. To be effective, the task group should include restoration contractors, engineers, architects, historic preservationists, specialty product manufacturers, academics, government and institutional facilities owners and maintenance personnel. With the sort of work and discussion our ICRI task groups have routinely undertaken, we can begin to develop the clear guidelines this industry segment requires to promote high quality, durable, compatible aesthetic repairs.